Harrabin is getting excited about the latest Mickey Mouse carbon capture project! Given that Drax burns 7m tonnes of wood chips every year, I don’t think one tonne a day will make much of a dent. According to Drax’s press release, they have invested £400,000 in the project, but who ultimately has paid this bill remains unclear. 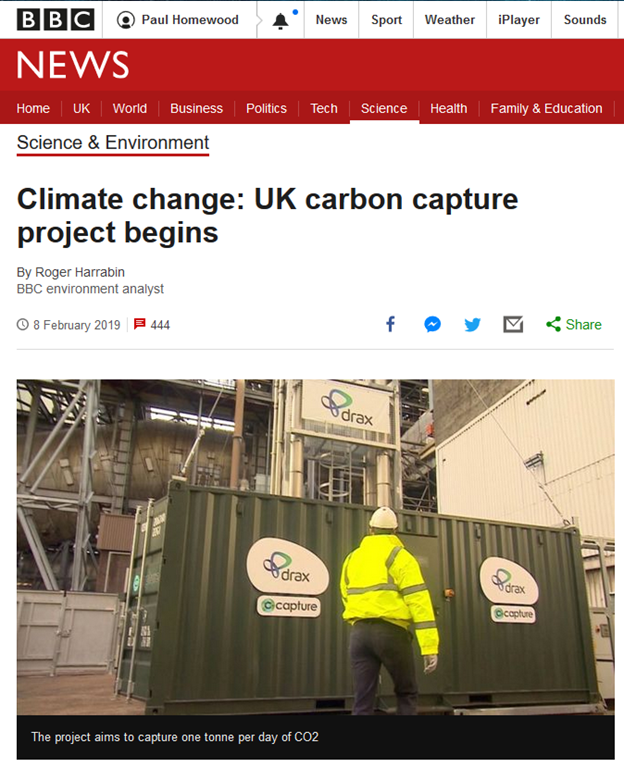 What we do know however is that Drax’s partner in this project, C-Capture, a spin off from the University of Leeds, is backed by £2m of government funding. It seems pretty likely that this project is directly funded by government in one way or other. Electricity from biomass at Drax costs £111.29/MWh, double the market price, under Contract for Difference. Any attempt to capture and store carbon will greatly add to this already exorbitant cost. And as yet Drax have not even managed to work out what to do with the tiny amount of CO2 they have captured. In a speech last year, Claire Perry claimed that the UK is already a world-leader in carbon capture. Has it not occurred to her that this is because the rest of the world sees no point in wasting money on a pointless exercise? “Burning biomass is absolutely the wrong option for so many reasons. Forests are vital for the health of the climate so we need to keep them not burn them. "The Drax experiment is so ridiculously tiny it’s hard to believe it’s not ‘greenwash’." In the finance pages of my paper today is a nugget headed “Trust Watch”, about John Laing Environmental Assets. The fund invests in, among other things, onshore wind, solar and aerobic digestion plants here and in France. The experts like the dependable long term cash flows. The only downside appears to be the uncertainty of trends in electricity prices. Queue here to sign up. Couldn’t they save more carbon by not shipping it over from North Carolina in the first place? Oh, no, it’s great because you don’t have to count the CO2 required to cut, dry, chip and ship the wood. Did you notice that they said doing it by wood would take forests about 3 times the area of India? A little bigger than North Carolina and Canada. I guess it would be just as accurate for them to say they’ve ‘captured oxygen’. In fact, as the O² component of CO² is 32u compared to the 12u of C they would have captured more of it. Where are all the bioligists telling the population that the world needs more CO2 to feed the Flora, which feeds the fauna? Scientists have a great deal to answer for over the CO2 scam. Ah but the CO2 haters are not scientists – they’re Scientologists! According to Drax they produce 22,800,000 tonnes of CO2 annually. 1 tonne per day is peanuts in comparison. The best use for captured CO2 from burning wood is to pump it into greenhouses and polytunnels where they could grow lots of biomass to burn and create more CO2. A virtuous circle, with no cost to the consumer …errrrr what could possibly go wrong. BTW Paul I don’t think you should use the words “funded by government”. All these crazy schemes are funded by taxpayers who have no say in how their tax is wasted. I suppose they could sell it to the carbonated drinks industry, but they would be in completion with the companies who already produce Co2 for that purpose. I seem to recall that their was a shortage a few months ago. Has anyone worked out the practicalities of replacing all Co2 emitting UK electricity requirements with wood pellet generation? How many acres of trees would we have to cut down every year? I read somewhere – on WUWT, I think – the other day that it would need woodland as big as India to do that. Was that just to supply the UK? If so, we would need several more planets to supply the entire world. Iirc, it was for the USA if they follow AOC’s green deal. First of all, Drax doesn’t emit any CO2 as a result of burning wood pellets. In the methodology for the measurement of CO2 emissions, the CO2 is deemed (presumably by a roomful of Sir Humphrey type Eurocrats) to have been emitted at the point of harvest – i.e. in the USA! So how much more wood do they need to burn to capture this small amount of CO2 while producing the same amount of electricity? Does that additional wood cause an actual increase in the overall amount of CO2 released? I would be slightly more impressed if it had been 1 tonne of carbon! Surely the gas going up the Drax stack contains CO2 and H2O only. Removing the H2O can’t be too hard – leaving CO2. The flue gas from burning wood, coal, gas or oil consists mostly of nitrogen, oxygen, CO2, water vapour, dust and, noble gases, along with relatively tiny quantities of other acid gases like SO2 and NOx. So it’s a bit more complicated than your note suggests. But not all that much more. Full scale CO2 capture, for the production of insustrial CO2 for beer and soft drinks must go back to the late 1800s. Most recently, it has been proven technically realistic but economically costly in Canada and the USA. 20 years ago, I and colleagues in Denmark, Norway, USA, and UK did our best to develop large-scale infrastructure to capture CO2 from the coal stations and industries around the North Sea rim, compress this until the CO2 became super-critical, when it becomes a splendid solvent for oil, using this to “wash out” much of the oil remaing at the end of an oilfield’s normal life from the UK, Norwegian and Danish oilfields. The idea, widely used in the USA since the early 1970s, extends oil fields for up to 40 years and even more. The oil. displaced in the reservoir is replaced by permanently sequestered, pressurized CO2. Of course, we were fought by “environmentalists” on the spurious grounds that burning oil emits CO2 using all sorts of scare stories to convince Blair’s Government to reject our efforts. One memorable Norwegian civil servant at their NPD insisted that if Norway should collaborate with us, then only “Norwegian” CO2 could be sequestered in Norwegian oil fields. The main fact of life, 20 years later, is that oil (and) gas production has fallen hugely since and that all three countries face massive de-commissioning costs (£100 billion?) and endless future bills for imported oil and gas. One day, may be, I will write a detailed account naming the rascals who sabotaged this perectly feasible solution. They didn’t say where they intended to put this CO2. Amine absorption is used because it is relatively inexpensive and efficient. Membrane or membrane plus zeolite separation works quite well. The problem is where do you put the carbon. I’m not aware of any of the US CCS attempts working well enough to put into general use. I’ve written US air permit applications for about 35 years. Over the past few years we had to address GHG’s in the applications. The BACT (Best Acheivable Control Technology) analysis for GHG was easy. It failed on technical feasibility and, if you assumed technical feasibility, cost. They couldn’t decide that if we were going to run high pressure underground pipelines to the CCS facility or build one at every major GHG source. I’m sure the technology has improved and in the UK money is no object if you are saving the planet. One tonne removed and pumped back into the air? How green can you get. According to yesterday’s FT they’re re-releasing into the atmosphere. Didn’t read the FT and figured that an absorption trial would go back to the atmosphere. Where do they plan to put the CO2 when they go full scale? Or have they thought that far ahead? Costly genuflecting. The mindlessness is breathtaking. Nature will just restore whatever CO2 they think they are removing from the atmosphere. Is this a capture-and-release, or a capture-and-cook? My bad .. not fishing .. In 15 years, the simplest and most economical 300 MW SMR that could be designed will be available at £462 million. 150 of the BWRX-300, at a cost of £70 billion will supply all of the 24/7, low-carbon electricity the UK uses for 60 years. Renewables will cost at least 8X more, use 10X/16X more resources and cause 100X more land and seascape desecration, ecosystem destruction and species wipe-out. “directly funded by government” = directly funded by the taxpayer. They said they would sell the CO2 into the market, as its a very useful commodity in great demand. I buy CO2 in gas cylinders – we use it in food preservation (displaces oxygen and stops decay etc) as do all food processors (most cold stores as flooded with CO2) and the entertainment industry use it to create ‘fog’ (‘dry ice’ is CO2 in a solid form that creates fog as it eveporates) Of course our use is just a temporary stay for the CO2 that eventually finds its way to atmosphere and into plants. Its doubtful the Drax method is even remotely economic. Then of course we have CO2 fire extinguishers. There’s no end to uses for this wonderful gas. There are only two options. The Taxpayer or the Customer. Or, I suppose, Both. It seems pretty likely that this project is directly funded by government in one way or other. Where there’s a grant, there’s a way. And, l believe, Chris Huhne is involved in selling the chips. More than 1 tonne of CO2 is released when you burn 1 tonne of wood. Also the amount of CO2 absorbed by a tree with a long lifespan is far more CO2 absorbant both directly and indirectly than biomass. Drax should stop burning wood altogether.